1 of 3 Heat oven to 400 degrees . Roll out piecrust and fit into a 9-inch pie plate. Crimp edges. Place a piece of parchment on crust and fill with pie weights or dried beans. Bake at 400 degrees for 15 minutes. Remove parchment and weights or beans. Reduce heat to 350 degrees . 2 of 3 Meanwhile, pierce sweet potatoes a few times with a fork and place on a plate. Microwave for 3 minutes. Turn over and cook another 2 to 3 minutes. Let cool slightly, then carefully slice and scoop flesh out into a large bowl. Beat sweet potatoes, whole eggs, butter, brown sugar, heavy cream, 1/4 cup of the bourbon, the cinnamon, vanilla and nutmeg until smooth. Transfer to crust and smooth top. Bake at 350 degrees for 40 to 45 minutes, until firm. 3 of 3 Combine powdered egg whites and 3 tbsp warm water. Stir gently until dissolved. Beat in remaining 1 tbsp bourbon until frothy. Gradually add granulated sugar and beat until stiff peaks form, 5 to 7 minutes. 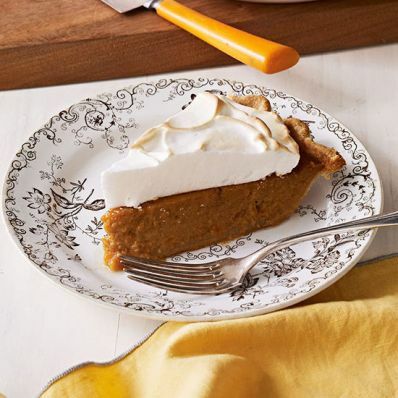 Spoon onto warm pie, making sure meringue reaches edge of crust. Broil on HIGH for 1 to 2 minutes, until lightly browned, watching carefully.